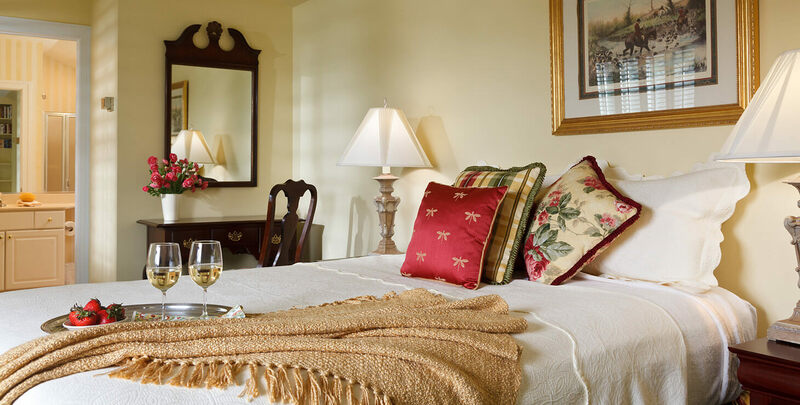 The Stable Room is a charming room with a specialty queen-sized bed dressed with hand-made pillows and bedding ensembles done in a rich, Hunt Country elegance finished with crisp white linen and pillows. The en suite private bathroom has marble floors, plush towels, and shower. Tucked next to the large window is a Queen Anne reading chair and lamp. A secretary and chair align the wall across from the built in bookshelves and closets. Enjoy our outdoor seating on Amish rockers looking over our tennis court and grounds.